Zellweger Uster developed in 1943/44 on very short notice the wireless station "Kurz Lang 43" (Long- / shortwave station 43) to replace the Telefunken Kurz - Lang - Station which could not delivered by Telefunken any more due to wartime restriction of components exported from Germany. 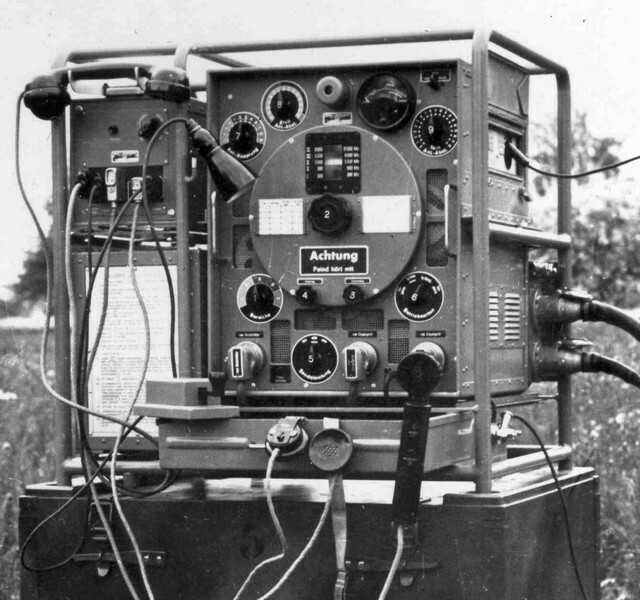 The Zellweger "Kurz Lang 43" was technically based on components of the "FL 40" station, but the frequency range was changed for higher frequencies in the shortwave band, the transmitter has been redesigned for this purpose (the receiver did cover the higher shortwave frequencies anyway), and capabilities to run the station from a remote site have been integrated. 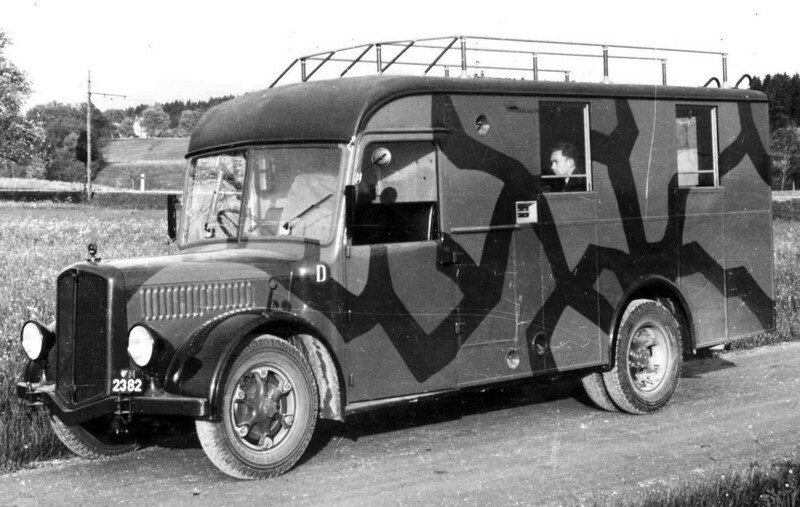 The standard use of the station was on a light truck for mobile operation in the Anti Aircraft Troops coordination network of the Air Force; with the vehicle antenna, even mobile operation while on the road was possible. The station could be taken out of the truck and it's components were stored in ten heavy wooden crates, so (trans)portable operation was possible in principle. Three phase (50V, 150 Hz) electric generator to be powered from a petrol operated or electric motor, rectifier and inverter; transmitter and receiver in steel tube frames. The motorized "Kurz- Langwellenstation 43" "KL 43" or G-Station is a wireless station constructed from adapted components of the Zellweger, Uster, wireless station FL40 built into a light truck, due to an integrated power supply from a vehicle generator and a roof antenne, the station could even be operated on tour. 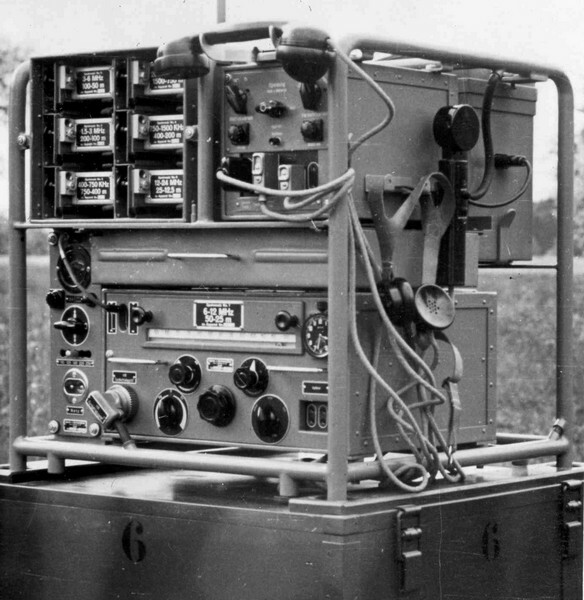 The "G-Station" was used in the coordination network of the Anti Aircraft Troops of the Swiss Air Force to be used as mobile medium power station; it's components could also be used independently from the vehicle in a fixed shelter. The ten crates with the complete material of the station had a total weight of 817 kg. After the reorganisation of the Swiss Army in 1951, the station got the new designation SE-218/m and has been used by Landsturm units of the Army until it's final withdrawal in 1967. The transmitter is an adpted FL 40 - Transmitter with modified shortwave bands. As found in the Kurz-Lang Station Tfk / "D-Station", the transmitter is installed on a steel tube frame. In contrast to the transmitter of the FL 40, the frequency ranges are shifted to the higher shortwave spectrum: 300 - 380 / 380 - 600 kHz and 3000 - 5330 / 5330 - 8000 as well as 8000 - 12000 kHz, a luminescent quartz crystal can be used to calibrate the transmitter on the frequency of 8000 kHz. In the three stage transmitter, a EBL21 valve is used in the auto-oscillating driver stage, two EBL21 valves in the frequency doubler stage and two OS41/1250 in the final / RF output stage. The modes are A1 (CW), A2 (modulated telegraphy) and A3 (telephony), the transmitter is grid-modulated in the RF output stage, another EBL21 is used in the modulator stage. The output power can be set to low/ tune (�Einpfeifen� / �Klein�) 5 - 7 Watts, medium (�Mittel�) 20 - 30 W and high (�Gross�) 80 - 120 W.
The plate voltages of 330V in the modulator / driver stages and 1200 V in the output stage is generated from the three phase 50V / 150 Hz current by transformers and rectifiers (four valves PV 200/600). Receiver frame KL43 with All wave receiver "Uster", reduced frequency range with coil sets only up to 24 MHz and a special tuning knob for fine tuning. Transmitter frame KL43, transmitter with adpted frequency range and controls for remote operation. The receiver used in the KL43 is the All wave receiver Uster / E41, its equipped with only seven coil sets to cover frequencies from 200 kHz - 24 MHz. In contrast to the standard E41, it comes with a special main tuning knob with fine tuning, there is a station clock installed at the right of the receiver front panel (unlike the FL 40, the clock is not mounted at the transmitter frontplate). The station can be used with the vehicle antenna and also with remote antennas: for shortwave operation, a 14 m mast with pluggable elements, a long wire antenna for langwaves. There is on opional 2,4 m rod receiver antenna, the receiver can be powered from the 50 V three phase generator and a recitfier or also from accumulators with an inverter. The light truck Berna CR1D has a 65 HP diesel motor and has a total weight of 4780 kg, the vehicle has a three part L roof aerial on board, as well as a 12 (-14) m pluggable mast for shortwaves and a 30m longwave long wire antennna between two 12 m masts. The transmitter and the receiver can be remotely operated, this can be done via a five pole cable or over field telephones lines using a sepecial remote control set. The remote operation sets are installed on the steel tube frames, there is a service telephone link between the receiver and transmitter site.